I just glommed this series. I love the author's voice, and her romance stories. 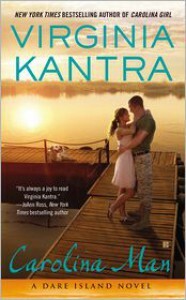 I think my favorite in the series is still the very first book, [bc:Carolina Home|13187657|Carolina Home (Dare Island, #1)|Virginia Kantra|https://d202m5krfqbpi5.cloudfront.net/books/1325541949s/13187657.jpg|18368575]. I didn't LOVE this one as much as the first two, but I certainly enjoyed it. Can't wait for the next book!